Manipur is a tiny state located in the north eastern region of India. The state is known throughout the country for its beautiful arts and culture. The state also excels in producing famous sports personalities and there are many players who are performing outstanding in their fields but not very known by the people. 24 years old footballer, Thoi Khangembam from Manipur is one of the players who have done exceptionally wonderful work in the game of football. 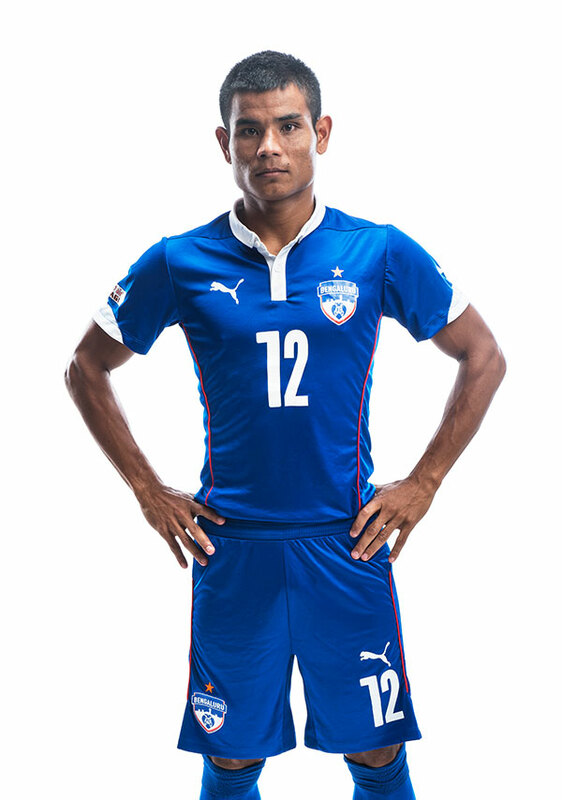 Thoi is currently playing for Bengaluru FC and has been selected in the auction of the 2nd edition of Indian Super League, 2015. For his splendid performance, Thoi is one of the top ten players who are most wanted in the ISL auction which will take place in Mumbai on July 10. E-pao: Please tell us something about your childhood. Thoi:: I started playing football since my childhood. I participated in sports events organised by schools, local clubs since the time I was in my third standard. E-pao: How has been the journey of your football experience so far? Thoi:: I was first selected under16 from Manipur and I went to Tripura for a match in 2004. In 2005, out of three players from Manipur I was selected for India (under 17). The first trial for the selection was in Shillong, then in Kolkata, Bangalore and the final selection trial was in Goa. After the selection from Goa we participated in a match (under 17) at Portugal. Later, I participated in the qualifying round for Asian Football Confederation (AFC) under 17, which was held in Delhi. We did give our best performance during the match. I was again selected for under 19 for Indian team in 2007. I played for Indian team from junior level to 23. Then for the first time I joined Indian Bank football team and played for the 2nd Division I League. I signed a new contract with Mahindra United for three years till 2010. Then I joined Salgaocar club, Goa in 2010 during which we became champion of Indian League. I was then invited by Baichung Bhutia to play for his club in United Sikkim which eventually qualified for the 1st division Indian league. Then I returned to Mumbai as I was offered to join in Mumbai Tigers. After a successful one year stint with Mumbai Tigers I was offered a two years contract with Bengaluru FC the following year. In my first year with Bengaluru FC we won the I League trophy and in the second year we became winner of the Federation Cup, 2015 and subsequently the runner up of I League 2014-15. Players who perform well and show great potential in Indian league are selected as top ten players in the Indian Sports League which will be auctioned on July 10. Out of the ten players, fortunately I am one of them. E-pao: Congratulation on your success. In the coming auction for which team you wish to be selected? Thoi:: Thank you. I would be honoured to play for any of the ISL teams. I am at my peak and I'll give my best. E-pao: Please share your experience with Bengaluru FC. Thoi:: There are eleven I League football clubs in India out of which Bengaluru FC seems to be the best for a player like me. Here in Bengaluru FC we get the same facilities provided to the players of other countries such as in European countries. This club is different from other clubs in India. They provide proper diet management and gym facilities which helps us to be at the best level. I have been into this profession for more than ten years and during my tenure I find Bengaluru FC as one of the best clubs which provides the best of training and the best of football club environment in India. E-pao: Do you face any challenge or difficulty being a footballer from Manipur? Thoi:: Starting from grass root level to the facilities provided in the state, there are lot of challenges face by Manipuri players in terms of quality coaching, nutrition and infrastructure. One has to work very hard to reach to the top level. From the beginning if there would have been any proper football academies which is accessible to football aspirants in the state the players wouldn't have faced such difficulties. Importantly there are so many football players in the state and not a single professional I League club. In the beginning I faced lots of challenges whether in transportation, nutrition or language. But in spite of all odds we have to give hundred percent and become a dominant player. E-pao: What do you think is required to uplift football in Manipur? Thoi:: There should be a proper structure and system in place to bring up the players from grass root level. In Shillong, there are two clubs of I League. Manipur being a state which produces maximum number of football players in the country, it is a must to have an I League Club in the state which will bring professionalism in the sport of football in the state. According to my knowledge most of the Manipuri players are stronger than other players and there might not be a single club in India which doesn't have a Manipuri player in their teams. There are many more competent players in Manipur but due to lack of proper systems and structure they remain unnoticed. Same goes to the young players and aspirants of football. I strongly believe that building of academies or school of sports in Manipur will surely bring success to the state. E-pao: How did you come in contact with the International Agency, Libero Sports? Thoi:: Famous players like Ronaldo, Messi and many others have their own agencies. A player is supposed to be concentrating on their performance and the rest issue such as payments or contracts should be handled by their agencies. Libero Sports is the leading agency in India. Through my mentor and friend, Sukhvinder Singh (Managing Director of Libero Sports) I came in contact with Libero Sports. Since the very beginning of my career I have known him. Sukhvinder was in Nike before and our relationship started way back when I was playing under 17. There was a match against Pakistan (under 17) and Sukhvinder challenged me that if I can get four goals he will provide five years Nike sponsorship. I scored five goals in that match. Nike sponsored every kit I required for the following five years. And that's how our relationship continued. E-pao: Out of all the matches you have played so far, which one is your most memorable one? Thoi:: The most unforgettable match was the one I played in Johor, Malaysia on Feb, 2015. The match was played between Bengaluru FC and Johor Darul Ta'zim FC. E-pao: Why was the match special for you? Thoi:: The clubs from other countries are more advanced than the Indian clubs. They are in a different level. But we got the opportunity to compete with such strong opponent team. And we could prove to them through our performances that 'we are no less than them.' The opponent team was one of the best teams of Malaysia and showing our best performance to such strong competitor is a big thing. And when the coach of the opponent team complemented and appreciated me for my performance I felt incredibly happy. E-pao: What piece of advice would you like to give to the young players of Manipur? Thoi:: Sports is important these days but education is also necessary. One must choose the field they want to progress in life with great thought. Regular practice is necessary and must be disciplined too. Young people should avoid using of drugs and narcotics in order to stay healthy and fit. Most importantly parents play a key role in guiding their children in the right direction. E-pao: Bandh/blockade becomes a regular incident in Manipur. What would you like to appeal to the people of Manipur? Thoi:: Manipur being a diverse state has numerous groups of communities fighting for their own good. When everyone starts thinking as 'one', unity will follow and Manipur will become a peaceful state. E-pao: Players from Manipur and Northeast region are stronger than the players from mainland India. Do you agree? Thoi:: Yes. Looking at our performances even the coaches from outside the country know that players from Manipur and Northeast are tough and have strong will power. E-pao: What is your regular routine? Thoi:: My regular routine is to get up at 05.00 am and have breakfast and then go for the training session which will be followed by gym session later in the day. At Bengaluru FC we follow a proper diet chart. We eat nutritious food such as brown rice, pasta, etc. But at home (Manipur) the rice is so tasty and contains lot of starch hence I have to limit my intake by measuring it with a bowl. Normally half an hour after having breakfast we go for training session. At 11.30 am we would finish our training and then go for a shower for half an hour. We have lunch at 12.30 pm and then rest for a while. From 3.30pm we go to gym and practice if required. Then we have dinner at around 8.00 pm to 8.30 pm. E-pao: Apart from sports do you have any other hobbies? Thoi:: We don't have much of leisure time if we are in club. We used to have matches on Saturday and Sunday so we don't get much time to go out. But I do listen to songs and go out for movie whenever I get free time. This article was posted on July 06, 2015.